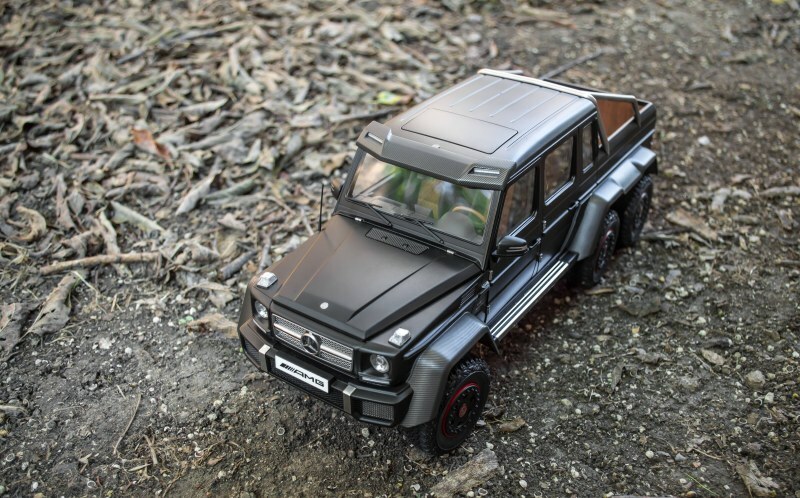 The Mercedes-Benz G63 AMG 6×6 is based on the infamous G-Class that has been around since the late 1970s, and its existence has proved to be quite unique to say the least. 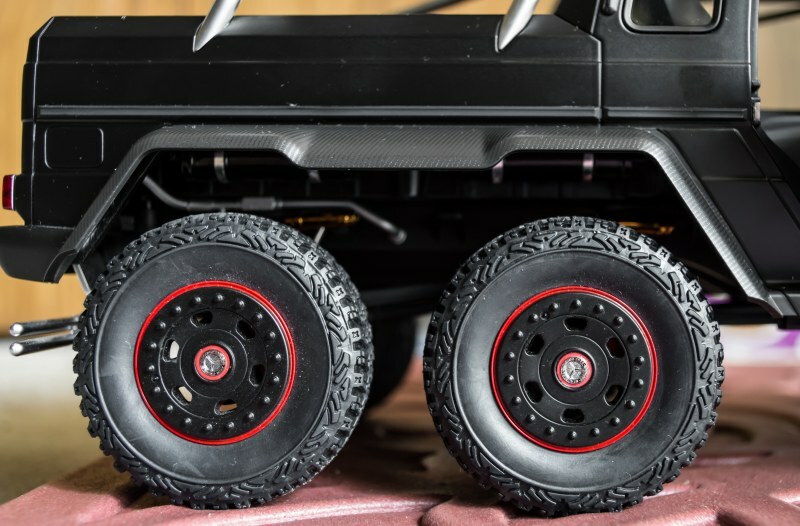 Over the nearly four decades since it was released to the public, it has become quite a status symbol for the Hollywood celebrities and elites of the world, as well as being a great off-roader with the power and strength to match the Land Cruisers and the Defenders. 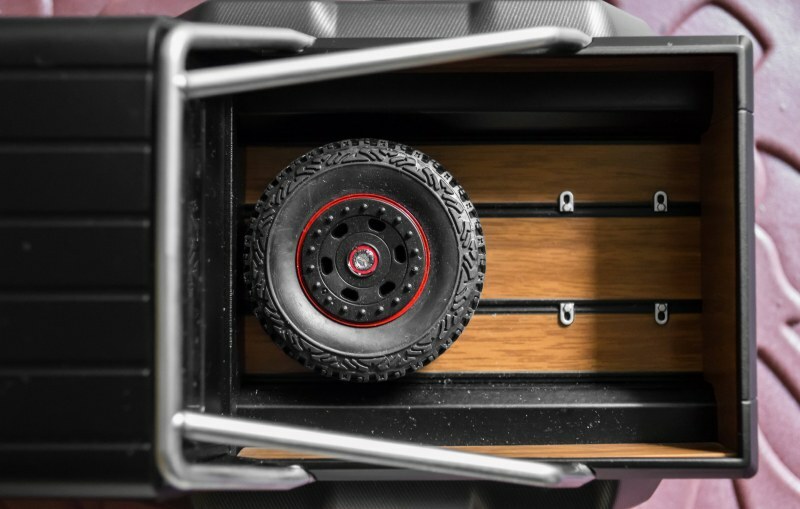 However, design-wise, not much has changed with the infamous box on wheels…until now. 2014 marked the year the honchos over at Mercedes-Benz and their crazy performance department, AMG, developed this monster. The most surprising fact is not that the design exists, but that it’s a car that consumers and AMG fanatics alike can buy. The 6×6 came with a monstrous 536hp and 561 lb-ft of torque propelling the tank-like box on wheel to a top speed of ~100mph. Of course being such a strikingly unique car, AUTOart had to have a crack at producing a model. 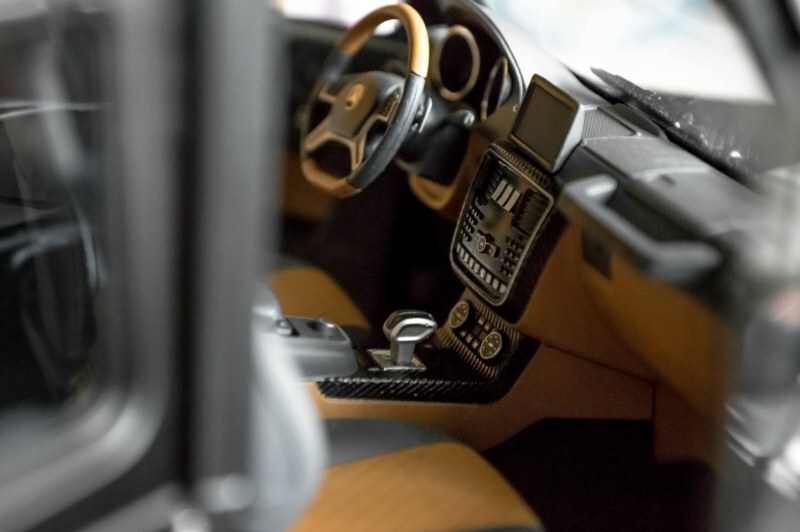 The 6×6 is part of AUTOart’s Signature series as well as being part of their unfortunate change to composites (plastic). I preferred the black because it gives the model a much more menacing look. The model feels rather light in the hand, simply because only the frame is diecast and not the body itself. Overall shape is true to the real car, although the fragile plastic components on the car will potentially detract collectors. Now AUTOarts composite series is coming at a full swing, they need to figure out a way to maintain the same metallic paint colors offered on their diecast models and sway away from all these matte finishes that honestly, is getting quite boring to say the least. 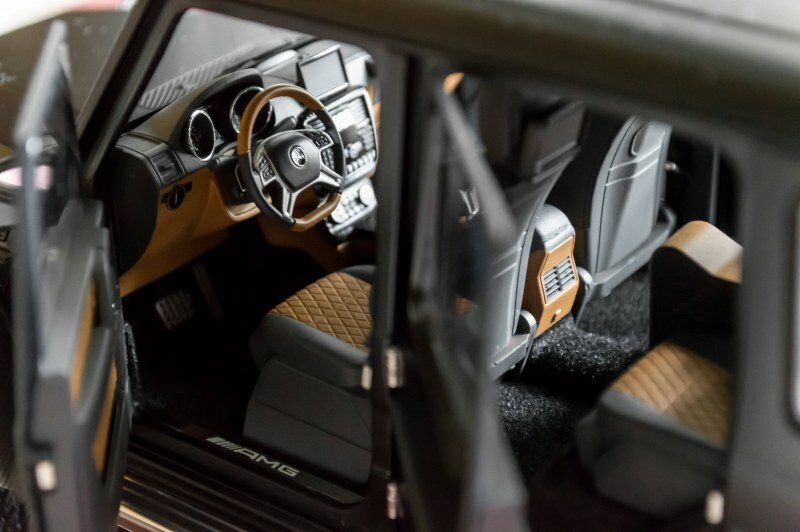 Onto the interior of the 6×6, AUTOart has done a respectable job, though definitely not their best work. The carbon fiber accents and Designo seat patterns are represented faithfully. Carpeting is standard for AUTOarts of this caliber as well as details on all the bells and whistles. Now one thing I do have to mention is that the dashboard looks rather… plastic and fake. Being a Signature model, I wish they would’ve paid more attention on details in regard to the dash. Another aspect I wish AUTOart would’ve included is the decal or at least an AMG image on the touch screen on the center console. The engine features all the necessary components, staying pretty true to the real car. The 6×6’s engine is definitely not much of a looker (Then again most modern cars engines aren’t). 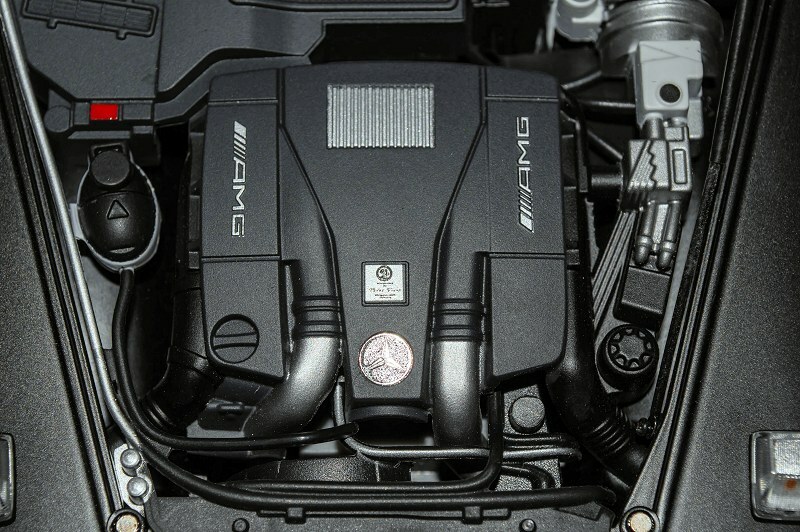 The hand-made V8 engine is well replicated and there isn’t much to complain about that. Fortunately, wheels are still done to the same AUTOart quality we have always known them for doing. The chunkiness of the wheels and the red accents around the rims are beautifully executed (as well as the fantastic articulations of the springs). 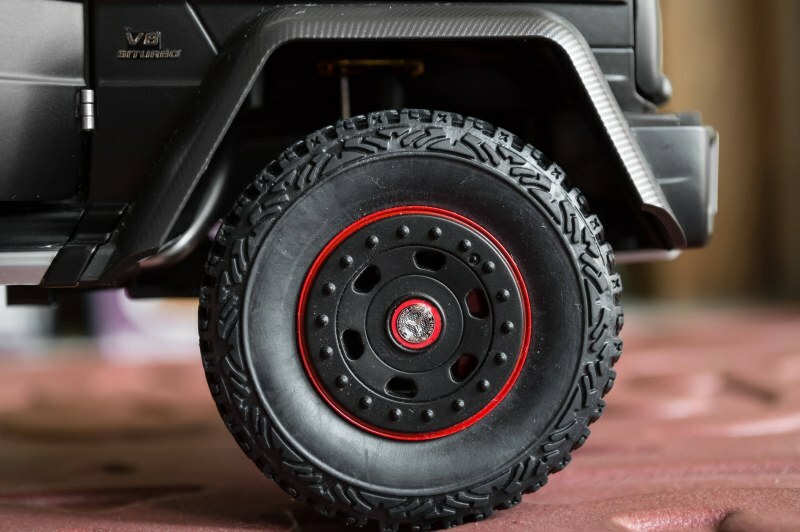 There aren’t any writings on the sidewalls of the wheels so there’s that…. Most model reviews will mention the brakes and calipers as well. However, the beefiness of the wheels means everything is hidden well inside and aren’t easily accessible. Now the base is definitely my favorite aspect of the model, which ironically is the weakest point of most AUTOarts. 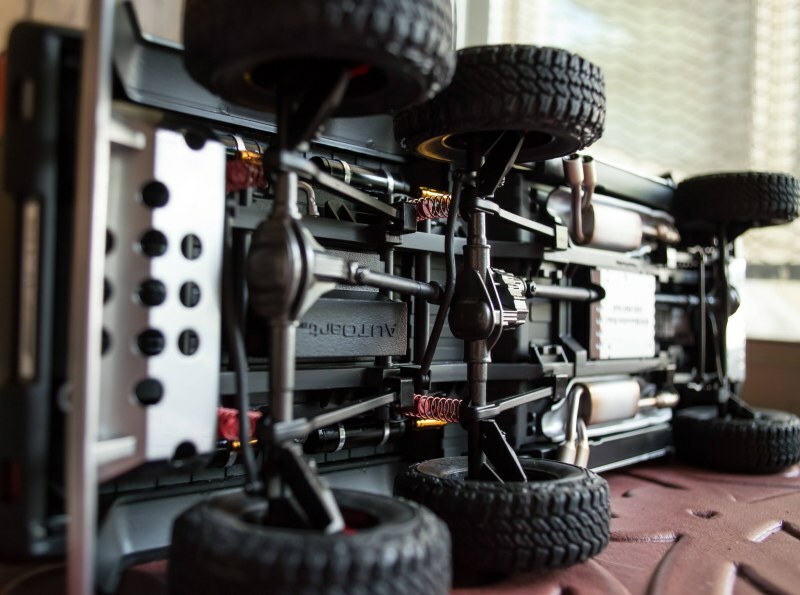 Flipping the model over, you will be treated with the workings of the glorious powertrain, suspension works, rotors and drivetrain that move the beast. Staying true to the G-class, the exhaust pipes are on both sides of the car. AUTOart even went in to add that burnt and used color of the pipes, giving the model a more realistic feel. The underbody panels protecting the front and rear of the car are metal as well! Bravo! The trunk of the car is just as nice as the rest of the car, featuring the faux wooden panels and four hook straps. The wheel being glued to place does not bother me one bit. However, no openable trunk does. Come on AUTOart.. seriously? On a Signature model? To conclude, the long-awaited release from AUTOart is a mix bag. Like its composite friend, the McLaren P1, there are both quite a few good and bad things. Shutlines are minimal, overall shape are true to the car, and carbon fiber and wheel works still remains a strong suit for AUTOart. However, flimsy panels, light on the hand, and no accessible trunk door still remains to be quite a debate. With a price range of around $250 for this “plastic fantastic” model, more details and cost cutting should not be much of an issue. Unfortunately, it is on here. Don’t get me wrong, it’s still a respectful effort. But would I recommend it? That’s depends on what you collect. AMG and Mercedes fanatic? Of course. Unless you want GT Spirits take, although that does not have any openings. Out to obtain your first Signature or first Mercedes? Look elsewhere. 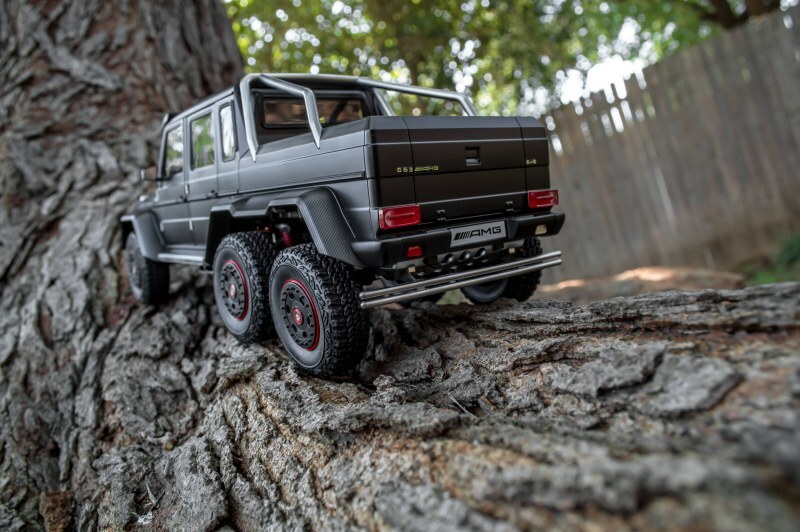 9 Responses to "REVIEW: AUTOart Mercedes-Benz G63 AMG 6×6"
Thanks for the review and exceptional images. I too would have preferred an opening tailgate. As you I too am getting tired on the Matt, lifeless finishes. It must be the composite material that is stopping them from their traditional, metallic colours. AUTOart am I wrong? I don’t think the composite material is preventing Autoart in producing models in metallic finishes, I think it’s more of cost cutting or even a fad thing. Besides, Aa has done several composite models in metallic finishes, which turned out well. I think they need to add more clear coat on some to make it more at par with their older finishes. The problem is, this plastic is too flexible. With every real layer of paint it becomes easier to crack, so the color is added in the mold. As far as I’m aware of there’s no real layer of paint on these kind of models, the body is polished for shine and that’s it. That what I suspected too. I do get that plastic is more flexible, but there are flexible paints. For example what Tamiya produces and use for their built 1/12 models. Also, the composite line from Aa are painted with multiple layers, then polished. I have seen a green Huracan, taken apart and when you see the underside of the body, the plastic shell is moulded in white. Being the time and buck savers for diecast manufacturers, engine covers is something that I always wish they start making removable. At least for some premium class models, I would love this feature. AUTOart has actually done removable engine covers before. Their old RX-8 come with in AND a tool to help remove it! I recall that die-cast model being $60ish? Didn’t know the Autoart one was plastic. Have got one on order from gt spirits .How do compere. 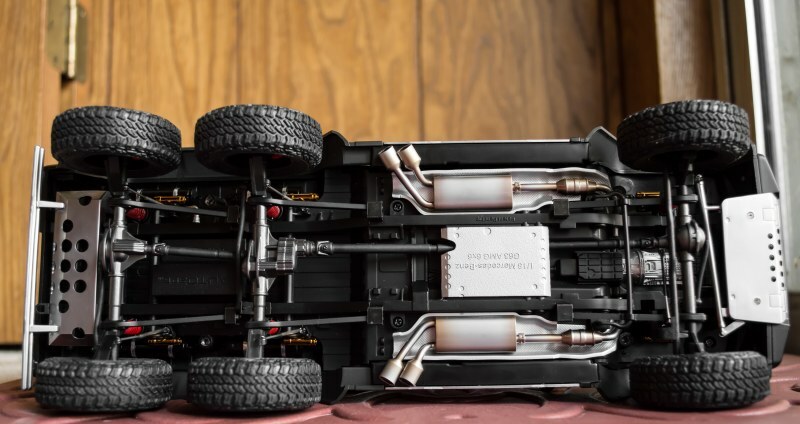 AUTOart wins on overall detail, opening parts and fully articulating suspension.